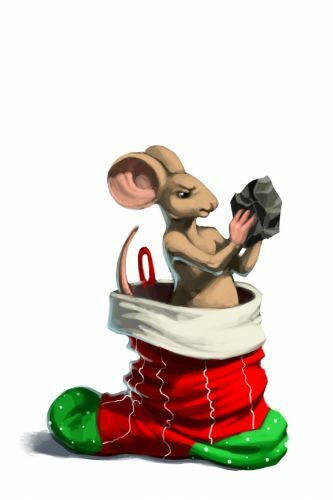 The Stocking Mouse is an Event Mouse found during the annual Great Winter Hunt event. Forget scamming humans into giving up the cheese this Christmas. . . everybody knows that it's Santa who's really got the goods. Santa's a generous guy. He won't care if he has to fill a few extra stockings while he's on his rounds. Unfortunately for the Stocking Mice, they’ve also forgotten that Santa keeps tabs on everyone, and they’ve been very naughty this year. Oh well, maybe they can swap their coal to the Scrooge Mouse for a few crumbs of stale cheddar. Information on how to locate and capture the Stocking Mouse can be found on the current Great Winter Hunt location page. 15 December 2009: The Stocking Mouse began dropping Four Festive Stockings as loot as part of the Great Winter Hunt '09. 13 December 2016: The points/gold for Stocking Mouse were changed.